Liquid Web is known around the Internet as very reliable Virtual Private Server company that focuses heavily on excellent customer support and extremely reliable servers. Liquid Web is one of the most expensive VPS service companies that exist and for good reason, their demographic is those that demand the upmost in quality as priority #1 at no matter the cost. You want the best VPS? Look no further. SPECIAL OFFER - Earn up to $30 to fully and honestly review Liquid Web. Click here to start the review process. You'll get $15 to review Liquid Web and I'll double that to $30 if you sign up through our link and review Liquid Web after using them for at least a month. Start here! All you need to do is search Google about Liquid Web and you'll notice that Liquid Web is considered one of the best in the business at VPS hosting. 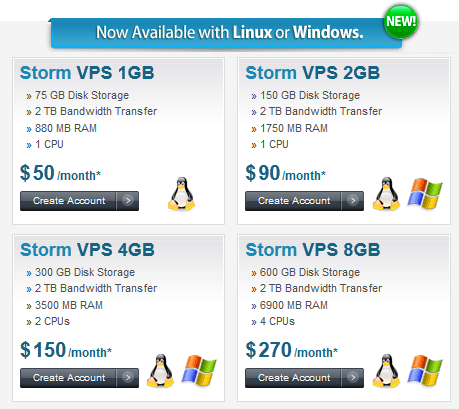 Besides the VPS plans you see on the right, they also offer "Storm Servers" which are a massive step up from basic VPS plans as they are on the cloud. I've done as much research on Liquid Web as I could and I report on these findings in this in-depth Liquid Web review. Below, you'll learn more about their service offers as well as my pros, cons, and concerns regarding their services. On with the essentials. Liquid Web offers basic shared web hosting, four VPS plans, six Storm SSD plans, and a massive amount of dedicated server solutions. In this review, I'm going to discuss Liquid Web's VPS plans and also review their Storm SSD offering since these are available as VPS plans as well. * The above price is considered the base price at Liquid Web. There are no cheaper plans and there's no way to pay less than $50 unless you downgrade to their shared web hosting plans. These prices are for unmanaged VPS with limited customer support. As for additional software fees, according to their pricing page, if you want Windows OS instead of Linux OS, the extra cost starts at $15/month and if you want cPanel/WHM will fully managed support, that is $10 a month. First off, before going deeper in this review, one of the biggest complaints I have with Liquid Web is the sign up process. You, my visitor, are extremely important to me and I want to disclose everything I can to you before sending you on your way to order. Directly under the VPS plans on Liquid Web, you'll see this "* Additional support management and software fees may apply." That's fine, I've got no problems with that at all (most hosts do this) but what are the fees Liquid Web? That question is not answered anywhere on the page, not answered via the Managed VPS Hosting linked page, and even doing a Google search about Liquid Web fees doesn't turn up anything. Where did I end up finding the fees in "The Essentials" section above? A sales thread from Liquid Web at Web Hosting Talk. Seriously? That can't be right, can it? So I started a live chat on October 8th, 2012 at 12:20PM MST and got Nic K. On the right, you'll see this short chat session. As it turns out, if you click on the "Pricing" link which has links referencing "Storm Servers" there is a full pricing breakdown, on the right side as shown in my screenshot. For me personally, I thought those links were misplaced since they were about "Storm Servers" and not "Virtual Private Servers" and, while I clicked that Pricing link before, I thought the pricing page was mainly for dedicated server clients. My eyes quickly scanned the stuff on the right side and dismissed it thinking that info wasn't related to their VPS packages. During that chat conversation, I thought quickly to ask if this was a common question, and my suspicions were verified. I'm estimating at least 75% or more of their interested VPS customers won't find the answer to this VPS fees question. By the way, during the sign up process, if you create a username and password, click next, you are asked for your credit card information before you see what your total monthly fee will be. Liquid Web should refine this entire ordering process to make it more user friendly. There needs to be a way for the customer to click on the VPS package they want, select the software they want, and see the total cost before entering their credit card and billing information. To me, their sign up process is unacceptable. Not only that, I can only imagine how many sales are lost due to the current system. If you haven't seen the Liquid Web dashboard that Liquid Web provides all customers with, you really should. On the right, take a look at what this dashboard looks like. This dashboard offers a wealth of information worthy of its own section in this review. Create or remove a Storm Server. Get a quick glimpse of your server's performance along with detailed information. Manage backups and restore a server from a backup. Use Server Images to create a new server image. Clone or resize the server. The dashboard even allows you to see a full history or server events, setup monitoring preferences, and directly console into your server to run your own commands. Under the History section, you can see account history events such as when images were created of your server as well as issues with the VPS such as POP3 being down. This also shows you error alerts, critical alerts, warning messages, and more. Under Account, you'll be able to manage your billing. The section includes an overview, profile information, invoices, and the users assigned to your account. Within this section, you'll be able to update your credit card, your account information, and more. Under Support, you'll have access to view open, recent, closed, and archived requests made from your account. For more information on Liquid Web's customer support, see the customer support review I did below. 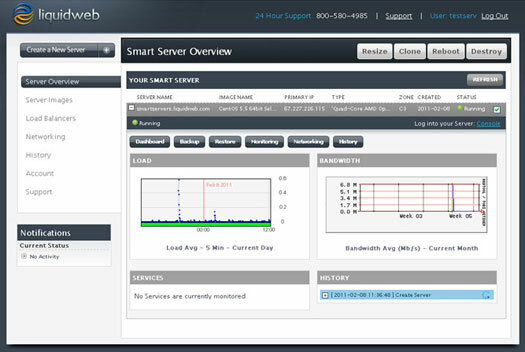 Self Managed - This includes 24/7 phone, email, and chat support, full hardware support, and a 100% uptime SLA. Core Managed - This includes everything in Self Managed plus core software support, security enhancements including update patches, 30 minute initial response time guarantee, and a 59 second phone response time. Fully Managed - Includes everything above plus virus and spam protections, free external migrations, full control panel support, control panel updates and patches, and Liquid Web will even support your third party applications to the best of their ability. 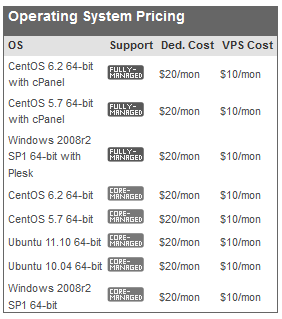 As you can see from the pricing screenshot I provided in this section, you can setup CentOS with cPanel or Windows 2008 with Plesk for $10/month and this includes Fully Managed support. Without cPanel or Plesk installed, you have the option to have Windows 2008r2, CentOS 6.x or 5.x, Ubuntu 11.x or 10.x, with Core Managed support for $10/month. Last, there's a huge set of OS options including Debian, Ubuntu, and Arch Linux under the "Self Managed" support plan that has no monthly fee. These options are shown in the full pricing page on Liquid Web if interested (I had to cut all that off to fit it here). Heroic Support® - The reason they call it Heroic Support® is because they have all the support options you could ever want in a hosting company. Liquid Web offers toll free telephone technical and sales support, a full ticket help desk system complete with tracking, and chat support, which I personally have had the pleasure working with for this review. Video Tutorials - The video tutorials section of Liquid Web is really impressive. What should be improved: Nothing! I combed through the site desperately trying to find something wrong with Liquid Web customer support and only stumbled across all the awesome they offer. Liquid Web includes a powerful and almost shocking service level agreement that states they will initially respond to your helpdesk tickets within 30 minutes, will respond to your live chat messages within 59 seconds, and they will answer your telephone call within 59 seconds. If they miss the mark, they will credit your hosting account by 10x the amount they missed it by. As an example, if they take 6 minutes longer than 59 seconds to answer your call, they credit you 6 x 10 = 60 minutes of hosting time. Liquid Web takes support to a whole new level with a SLA like this. They even include the above stats directly on the main Liquid Web website which I think is a nice touch. Maybe use the above image to compare to their current stats they show. Here is where I hope to go above and way beyond what these other "review sites" show you. Below, I have included Liquid Web reviews from a few trusted resources. By that, I mean, sites that have moderators that actually receive your review and then verify the authenticity of your information. Your review could be here and I'll pay you up to $30 for it! If you've used Liquid Web, please help me out by being my first LiquidWeb reviewer? I know I'll appreciate it and my viewers would too! Learn more. pedrosttau of WebHostingTalk has used Liquid Web for over 7 months at the time of this review posted September 14th, 2012 has said "". View this forum thread on WHT because it has several others who chimed in with their positive reviews of Liquid Web as well. 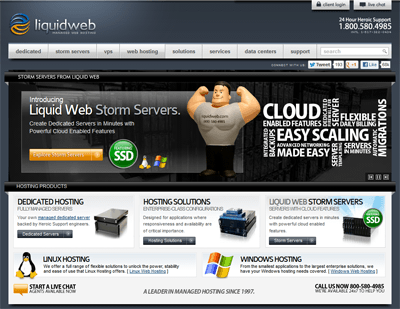 nebb0r of WebHostingTalk, who has used Liquid Web for over 5 years, on July 12th, 2012 wrote "I have had very very little downtime in the 5 years that I've had hosting with LiquidWeb. Right off the top of my head, I can only think of 1 time there was a 2 hour stretch where something hardware related went wrong. Out of 43,800 hours, that's a pretty good percentage! When something is wrong with my hosting, I have had nothing but stellar support." He also goes on to state that he's had a good experience with their third party software support and really did their best to help him. He also says "There are cheaper companies out there for hosting, but as the saying goes (and it's always rung true for me) you get what you pay for. 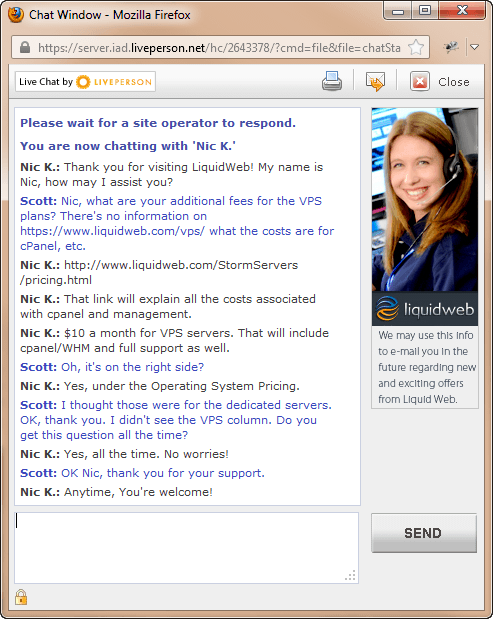 And, what you pay for at LiquidWeb is solid quality service and hardware performance." which is basically what I've said during this entire review. View this review thread on WebHostingTalk as it goes into great detail. mikedell1975 of WebHostingTalk wrote an interesting review on August 8th, 2011 that talks about the Dashboard features I wrote about earlier. In this review, he talks about accidentally building a misconfigured server (without cPanel) and support walking him through destroying the old VPS and creating a new one, without support intervention. I don't know many VPS hosts that can do this, so you can call me impressed! Matt Beswick wrote a Liquid Web review on his blog post and shared his experience with their service by saying "The first thing I have to mention is their customer support. Billed as being "heroic," they do their very best to live up to expectations. Of the hundred or so support tickets that I've created, all have had at least a response within 10-15 minutes, followed by regular updates." 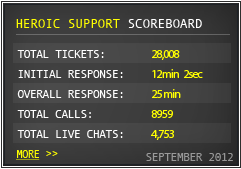 Heroic Support® - Liquid Web has the most impressive customer support backing of any VPS web host I've reviewed. As I've mentioned, their SLA is top-notch and practically guarantees you'll have support available to you at a moment's notice. 100% Network Uptime Guarantee - Liquid Web doesn't boast about 99.9% uptimes, their guarantee is that your VPS will be available to their network 100% of the time or you'll get a credit on your account. Daily Billing - If needed, you can setup daily billing to see exactly what you are spending each month. Root Access - With each VPS, you'll have immediate root access available to you. Wholly Owned Data Centers - Your VPS is hosted at a Liquid Web facility. No leased space or servers here! Sonar VPS Monitoring - As shown in the dashboard above, you'll have full access to your server stats at any time you need them. Liquid Web owns and operates their own set of not one, not two, but three data centers. They currently have three data centers in Lansing, Michigan and one data center they lease from in Phoenix, Arizona. Their Phoenix data center has the capacity for 2,000 servers and the three data centers in Michigan have a combined capacity of housing 35,000 servers. It is important to note the last Michigan data center was built in 2008-2009 and houses 25,000 servers all on its own. Such an amazing growth. They have a news section that documents the ground breaking through the final launch along with video, it is quite impressive to see the shear size of this building. Here are some of the highlights of the Michigan data centers, for full information about both, click the "data centers" link in the navigation bar on the Liquid Web website. Cisco 6509 Sup720 Switches - The rack switches are 48 port 10/100 lines on a Cisco 2960 switch. 8,000 kVA power feed - Expandable to 32,000 kVA as needed. Multiple N+1 diesel generators - For reliable backup power. 24x7x365 manned facilities - CCTV security camera protection as well as 3rd party monitoring. Man traps - Entrances have traps in them should an intruder try to enter with interlocking doors. Tier 1 bandwidth - Provided from Level3, Global Crossing, Savvis, Inteliquent, and more. October 25th, 2011 - Liquid Web upgraded from "PIMS" to the new Dashboard I've reviewed earlier. This upgrade is quite impressive and has increased the usability for their customers. 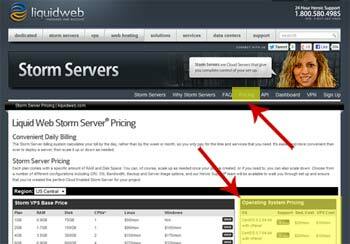 This new management system allows you to build your own Storm Server with a click of a button. You can now build (or destroy) new VPS plans or even dedicated servers within minutes! September 8th, 2011 - Liquid Web named as the nation's 1,703rd fastest growing company by INC Magazine. Liquid Web also announced SSAE-16 audit certification by the AICPA that addresses security risk, integrity, privacy and more. August 8th, 2011 - Liquid Web teamed up with ITEC and donates 300 PC's to underprivileged families. I'm a huge fan of large corporations that do this, so major kudos to you Liquid Web! Liquid Web has gone out of their way to be the best in the business both in hosting and leading the pack in customer service with the guaranteed answer times in their SLA. Obviously the biggest negative I have for Liquid Web is the sign up process which I went into earlier. The other issue I have is their current naming scheme. For whatever reason, Liquid Web thinks it is OK to name their standard VPS, their SSD VPS, and Dedicated Servers as "Storm." I think this is confusing and until I wrote this entire review up, I really didn't grasp the reasoning behind it which is, they are all "on the cloud." The biggest positive? Obviously the Heroic Support® which I've mentioned probably too many times, but also the availability of the SSD VPS. The "Storm SSD" brand starts at $100/mo for 2.7GB RAM, 35GB disk space, and 1CPU. Add $10 more for cPanel/WHM with full support. If you've never had the pleasure of owning a PC with an SSD, there are huge, massive gains with this Solid State Drive. Check out this link for more information on how SSDs work. Please note: My use of Heroic Support® on Best VPS Reviews is used with respect to Liquid Web's registered trademark. BestVPSReviews.com has no direct connection to Liquid Web other than to review their virtual private servers. Revision Date: October 25th, 2013. Disclaimer: Thanks to the compensation from some of the VPS hosts listed on BestVPSReviews.com, Scott Buehler, the owner of this website, is able to cover the costs associated with operating this website including web hosting fees, advertising, and other promotional efforts to get you to this site. I do not and will not accept payments to influence my independent reviews of these VPS web hosts. Lastly, without your continued support of my efforts, I would not be able to provide for my wonderful family of five and for that, I'm sincerely grateful. Thank you for visiting! Do I Even Need a VPS? Who Hosts Best VPS Reviews? Thank you for visiting my site. Thank you for reading what I have to say. Thank you for supporting me! Please, if you have any questions, feedback, suggestions, or just want to talk, send me an email from my contact form. This isn't a corporate ticket system, once sent, you'll have my email to talk to me, Scott Buehler, directly.